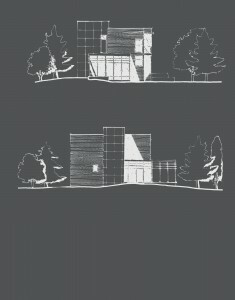 Nationally respected in the Arts Community, Nick Wade and Carol Beatty wanted to develop an all season residence on Georgian Bay. To satisfy client requirements and take advantage of both the long and short views the house was conceived as series of three boxes. The main upper and lower floors are in the large central box with living areas on the main level and bedrooms above.The stair housed in separate box is designed to aid in both heating and cooling. In the summer doors to the stairwell are left open to create a solar chimney to aid in cooling. In the winter doors to the stairwell are left closed in order to contain the heat within the central living spaces part of the dwelling. The third box is the screened porch. The porch serves to create a bug free exterior space in the warm weather and also provides and intimate link with the near views of the forest floor. (A recent addition of shutters has also made the porch a bear-free area).